If you are looking for a casual seafood restaurant with an elegant atmosphere, The Fish Camps are for you. With locations all over Jacksonville, FL including Ponte Vedra, Neptune Beach, and our newest location on Julington Creek, you won't have to go far to enjoy a meal that will satisfy your taste buds. This gift card is redeemable for dining or merchandise at Palm Fish Camp, North Beach Fish Camp and Julington Creek Fish Camp. It is not redeemable or refundable for cash. For balance information refer to your last receipt or visit our restaurants. Lost or stolen cards may not be replaced. This card has no value until purchased. 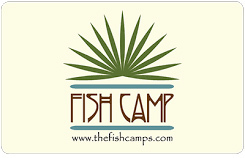 For more information visit www.thefishcamps.com. For balance inquiries call the phone number to a Fish Camp's location below.